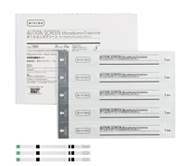 ARKRAY's AUTION Sticks(AUTION Sticks 10EA, 10PA, AUTION SCREEN) represent an enormous investment of company time and resources in producing the most advanced urine test strip for the medical profession. AUTION Sticks help ensure accurate measurements both visually and automatically. Covers all items necessary for urine testing. A maximum of 10 items can be measured simultaneously. Choose the combination which best suits your testing needs. Choice of visual measurement or automatic measurement on an exclusive analyzer.